Dr David Dao, 69, was dragged from his seat and down the aisle by United Airlines staff. It was worse than when he fled Vietnam. That's how an attorney representing the man who was dragged screaming from his seat and off a United Airlines flight said his client described the ordeal to him. Chicago attorney Thomas Demetrio said David Dao, 69, suffered a serious concussion, a broken nose, the loss of two teeth and other injuries when he was dragged off United Flight 3411 at O'Hare International Airport on Sunday. Demetrio said Dao, who was released from the hospital late Wednesday, will need reconstructive surgery. Dao is at a "secure location" continuing his recovery and will speak publicly at some point, Demetrio said. "What happened to my dad should never happen to any human being, under any circumstance," Dao's daughter, Crystal Pepper, said at a Thursday news conference with Demetrio. "We were horrified and shocked to hear and see what had happened to him. We hope in the future that nothing like this every happens again." Pepper, one of five children, said her father is a Vietnamese immigrant. "I would defy anyone to suggest there was not unreasonable force and violence used to help Dr. Dao disembark that plane," said Demetrio, who along with Stephen Golan, is representing Dao. He said Dao told him that being dragged down the aisle of the plane, "was more horrifying and harrowing than what he experienced in leaving Vietnam," following the fall of Saigon. He said they are investigating and gathering information for a lawsuit against the airline and the City of Chicago. The officers involved in the incident are city employees with the Chicago Department of Aviation. Thursday was the first time Dao's family has spoken publicly about the incident. Pepper said her father and mother were flying home to Kentucky from a vacation in California. They landed in Chicago for their connecting flight to Louisville, where both work as doctors. Four of their five children also are physicians, Demetrio said. "It has been a very difficult time for our entire family, especially our dad, and we are truly grateful for all of your support," Pepper said. Demetrio said no one from United, including chief executive Oscar Munoz, had contacted him or the Dao family. Munoz issued a public apology Wednesday in an appearance on ABC's "Good Morning America." Meanwhile, one of the 70 passengers onboard the flight offered more details about the incident. John Fuller of Fairfax, Virginia, described a chaotic - and bloody - scene as aviation security officers tried to remove Dao from the plane. Fuller said he and the other passengers - a military family with a young child, members of a high school lacrosse team and business travelers - were seated and buckled when a United employee came aboard and said that four people would have to leave the plane. "She was very terse," Fuller said. "She said 'Four people need to get off this plane, or we're not going anywhere.' "
When no one budged, Fuller said the woman left and returned with a list. She marched down the aisle. First she told a young couple they would have to leave and then a woman. Then she approached Dao, who was sitting in an aisle seat. Dao refused. Fuller said Dao's wife was not picked to leave. Security was called and three officers boarded the plane. Millions of people worldwide have seen the video of what followed. "One person yanked him out of his seat, and then I saw them starting to drag Dao," Fuller said. A woman ran to the front of the plane shouting, "What are you doing to my husband?" "She kept shouting," Fuller said. "The police kept telling her she needed to come out or they were going to arrest her. She finally stepped outside." But it wasn't over, Fuller said. Dao returned. But now he was bleeding. "There was blood spurting out of his mouth," Fuller said. "He had an agitated . . . look. "He went by me and kept saying 'I have to get home. I have to get home.' "
Fuller watched Dao stumble back to his seat. The security officers returned, but refused to restrain Dao because he was injured and bleeding, Fuller said. Two paramedics boarded the plane. "I saw a paramedic escorting Mr. Dao from behind," Fuller said. "He'd stuffed [paper] towels in [Dao's] mouth." 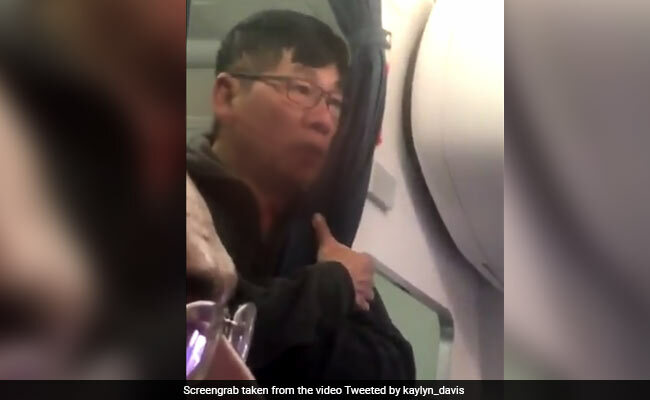 Fuller, a retired Marine who works for the Department of Veterans Affairs, then watched in horror as Dao collapsed next to his seat, lunged forward, spitting out the paper towels. They were covered in blood, Fuller said. "The paramedic then turns to the captain of the plane and says, 'Can you get me more towels?' "
Fuller said that's when several passengers got up and left the plane. There was blood on the seats and on the floor, Fuller said. Eventually, a United official boarded the plane and told those remaining they'd have to leave. Fuller said he was appalled by United's cavalier attitude toward the cleanup. He said as far as he could tell, no hazmat team was called to clean the blood and no effort was made to protect passengers when Dao returned to the plane, bleeding. About 45 minutes later, the passengers were allowed to reboard, Fuller said. When the four uniformed crew members boarded, passengers booed. One shouted, 'You should be ashamed to work for this airline,' " Fuller said. He said the pilot came on the loudspeaker and said: "We're on our way now. We're very sorry you had to witness this." Nothing more was said. And it wasn't just passengers who were shaken. Fuller said one flight attendant's hands were shaking as she tried to serve passengers their beverages. "I've been flying for 45 years, and I've never seen anything like this," Fuller said.